The V-4 is a 4-channel Video Mixer made for portable or fixed installation use. It is ideal for use in nightclubs, places of worship, theatres, and other live performances. The compact design of the V-4 gives you the freedom to make your video sources come alive. 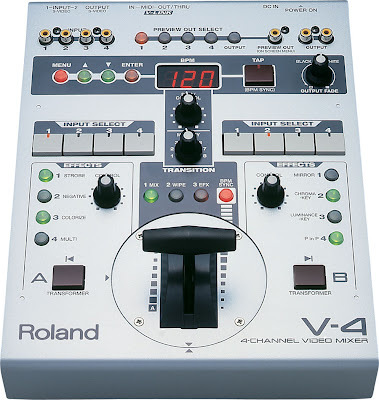 The V-4 is a part of the Roland SD video mixer line. For cutting-edge Multimedia artists, the V-4 offers V-LINK, an exciting feature from Roland that provides for realtime performance control over digital video, for the ultimate in creative expression. V-LINK allows the user to trigger clips, perform video effects and transitions in real-time when connected with the PR-80 (sold separately). The V-4 video mixer also has MIDI in/out/through, for real-time or sequenced control of video sources with effects and transitions. The V-4 is a part of the Roland SD video mixer line. See the SD Mixer Comparison. Best Video Product for 2004. V-4 is equipped with four composite (RCA Pin) inputs plus two S-video (Y/C) inputs. V-4 offers scene transition of the four video sources with Dissolve, Wipes (with a total of about 200 variations), and Switching. The V-4 outputs the same video source to all the three jacks (Composite x 2, S-video x 1), for simultaneous monitoring and displaying, without resorting to external distribution boxes. The input video sources are processed completely in the digital domain, and give professional video quality (13.5MHz, 8-bit, 4:2:2, DV quality). Ideal for use on large screens, and because the V-4 internal processing is digital there is no quality loss. The input sources go through independent 2-channel TBC (Time Base Correction) circuits to correct the time code, independent 2-channel Frame Synchronizers are also applied to the two sources at this stage. These processes enable smooth transitions and Dissolves, and ensuring stable images all the time. V-4 features independent 2-channel Video effects that include a rich selection of digital effects (refer to spec sheet). The V-4 also features composition effects such as Picture-in-Picture, Chroma-key, and Luminance-key. The effects are recallable by a single button press. Professional-use T-Bar cross fades for quick and intuitive operation. A V-4 innovation is that you chose to attach the fade however you like, either, vertically as standard for video mixer, or horizontally as a DJ mixer fader. The fader resolution has over 100 steps and offers extremely smooth transitions. Its metal body as well as its fader is strong and durable to be used in your active performance. V-4 is designed for its functions and operations to be clear from the front panel. Because it is simple to use its easy-to-use operation will enhance your realtime performance. Most of the V-4 functions can be selected and controlled without resorting to the manual. The preview function is controlled by the source selection button, and enables the user to monitor each of the input sources 1-4 or the output source before transition, to a single preview monitor, no more multiple preview monitors! You can control V-4's major functions (Ex. Effect selection, MIDI input setting, etc.) from the dedicated preview screen using the convenient On-Screen Menu. This is separate from the output to the main outs, so you can view it anytime you want. V-4's User memory function allows you to memorize and conveniently recall the panel settings, such as effect assignment to each button. The memory is saved even while the power is off, so you can store the frequently-used setting. Maximum eight configurations. The V-4 features video transition/effects that can be synchronized with MIDI. The BPM (beat per minute) of transition/effects can be made to follow the beat of a music track by hitting the tap button (TAP function). The functions of V-4 can also be controlled via MIDI equipment such as a MIDI keyboard controller. If you have the optional PR-80, various visual performances become even more creative by mixing the DV-7PR's numerous video clips with the V-4's visual effects, all with realtime transitions and composition. Here we have 4 inputs - 2 live cameras, text, still or video input coming from a laptop and all high quality video playback coming from the PR-80. By using a luminance key with the text input (e.g., PowerPoint, MediaShout, etc.) from the computer, you can overlay song lyrics,notes or messages over any of your other 3 inputs. Of the three outputs, 2 are being sent to the house projectors and the third one is recording the event to a VCR. At all times you can independently monitor your inputs and effects via the preview monitor. Note: S-video output or RGB-to-video scan converter is required to connect a computer to the V-4. In this example we have 4 live cameras being mixed to 2 house projectors, bringing image magnification (IMAG) to the room. We are also recording the event to a VCR as well. In a non-IMAG setting (i.e., school, courtroom, community TV) you would not send the output to projectors and simply record the event. At all times you can independently monitor your inputs and effects via the preview monitor. Often at corporate or church events, the playback material is on different media (VHS, DVD, miniDV, Betacam, etc.). In this example we have 4 inputs - 1 live camera and 3 different playback devices. The V-4 makes it easy to mix between material coming from a variety of sources. Of the three outputs, only two are being used - 1 is being sent to a lobby plasma and 1 is being sent to the house projector. At all times you can independently monitor your inputs and effects via the preview monitor. This setup can be greatly simplified by using a PR-80 to playback all video material as shown in Example 1 above. Having instant access to video material along with transitions and effects is the key to any visually stimulating display. In this example the VJ has material playing on the 2 DVDs, the VCR as well as their PC. The V-4 allows the real-time manipulation and transitioning between all of these inputs. The outputs are doing to the LCDs or plasma around the room or in the private boxes as well as to projectors throughout the house. At all times you can independently monitor your inputs and effects via the preview monitor. As in the previous example, this setup can be greatly simplified by using a PR-80 to playback all video material as shown in Example 1 above. Note: S-video output or RGB-to-video scan converter is required to connect a computer to the V-4. This example combines Example #1 and #2 above. It allows you to use and be recording a 4 camera shoot via the first V-4 but also overlay text or playback other video material via the second V-4 for room image magnification (IMAG). This configuration allows you to keep shooting the event (via your 4 cameras) independently of what is happening on the house screens. For example, your house screens could go to black or perhaps playback a clip (via the PR-80) - but your cameras could still be capturing audience or stage reaction. Conversely you can decide to use your multi-camera feed from the first V-4 for IMAG. At the same time, you can record the IMAG output via the 2nd V-4. At all times you can independently monitor all inputs and effects via the preview monitors.